Mayor Mike Moore and the City of Jeffersonville are committed to making our community a vital, healthy place to live and work. Initiatives like the Mayor’s 100 Day Wellness Challenge, Anchors Aweigh and the holiday Zumba classes are just the start. 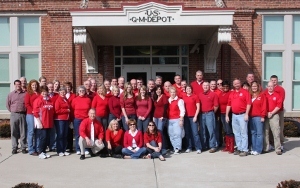 On Friday February 1, 2013 city employees are encouraged to wear red in honor of the 10th Annual National Wear Red Day to stand with women in the fight against their number one killer: heart disease. Click for more info.